If the weather is cold, you feel cold and so will the fish! They become sluggish and less interested in the chase so slow down your retrieve. Try three pulls then pause and repeat, this can often trigger a reaction. Check regularly the condition of the hook. Don't lose that special fish because of a blunt or damaged hook. Thread : Black or olive. Body : Olive seal fur with some pearl mixed in. Hackle : Palmered olive genetic grizzle hackle. Rib : Fluorescent green nylon (6lb). 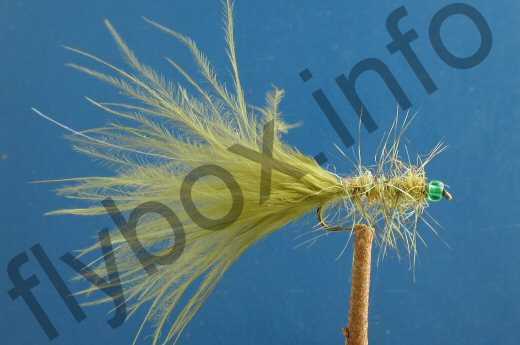 Currently there are no comments about the Greenbead Woolly Bugger fly pattern from other fly fishermen yet.